We love mini muffins in our house. They make a great snack, they freeze well and they are the perfect size for the kids. We’d tried lots of different recipes, and until now, our favourites were these Banana Chocolate Chip Muffins. Until we started making these Flourless Blender Muffins! Now we can’t get enough of these Peanut Butter Chocolate Chip Mini Muffins. When I make one batch, they disappear within the day and the kids keep asking me to make more. Did I also mention that these Flourless Blender Muffins are also sugarless? For real! I will warn you that once you make them, they will become a regular in your kitchen. 2. Add all the ingredients, except the chocolate chips, into a blender and puree until everything is smooth. This Flourless Blender Muffins recipe will make 15-18 mini muffins. They also also freeze well for any future snack emergencies. For more muffin recipes, check out this Pinterest Board. They sound delicious! 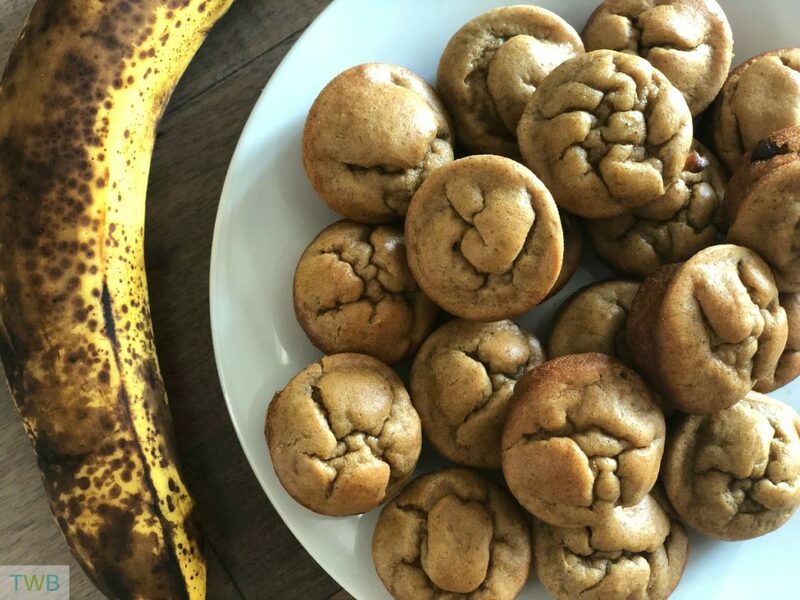 Thanks for sharing the recipe – I love the combination of banana and peanut butter, so will have to try making them myself. Great post! Thanks for sharing this recipe! I saved it and can’t wait to try it :). The mini-muffins sound great. No flour? That doesn’t seem possible. You always give such good recipes. By the way, I really enjoy wholemeal sandwiches filled with peanut butter and banana. So, I’m a convert already. I love the combination of banana and peanut butter Yummy! Pinned. The partner loves the peanut butter cookies I make foe Christmas. I bet he would like these muffins too! I’ve been on a serious health kick and I’m always seeking ‘good for me’ sweets (If there’s such a thing). I will have to pin this and try it out in the future. Got to try these very very soon! !